Recently, a range of mathematics support centres and online approaches have emerged in order to address the well-recognised limitations in the mathematical skills of STEM undergraduates (Jackson & Johnson, 2013). Whilst these approaches are often stand-alone without a discipline-specific context, studies have shown that students reported a positive impact of mathematics support on retention, confidence, performance and ability to cope with the various mathematical demands of their courses (Hillock, Jennings, Roberts, & Scharaschkin, 2013; Ní Fhloinn, Fitzmaurice, Mac an Bhaird, & O’Sullivan, 2014). We have developed and implemented a purely online, in-context mathematical support environment, placed in a chemistry and biochemistry context, with 24-h access, termed the Maths Skills Site (MSS), for STEM higher education students undertaking first-year science subjects (Johnston, Watters, Brown, & Loughlin, 2016; Loughlin, Johnston, Watters, Brown, & Harman, 2015). 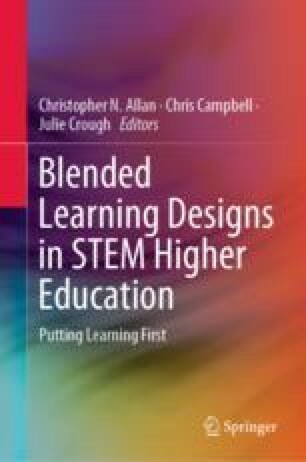 This chapter will review the development of current online learning support scenarios for mathematics in STEM and provide two case study analyses (first-year courses in chemistry and biochemistry), for the outcomes from two years of implementation. The findings from the case studies cover student perceptions, analysis of patterns of student usage of the MSS by mathematical topics and usage over time. Improvements were observed in student achievement of grades of five (credit), upon student usage of the MSS. Finally, we critique this approach to online active learning and identify future directions. The authors would like to thank the support of the David Green and David Harman for their invaluable assistance with the development of the Maths Skills Site. This work was supported by a University Learning and Teaching Grant. Chen, Y., Johri, A., & Rangwala, H. (2018). Running out of STEM: A comparative study across STEM majors of college students at-risk of dropping out early. In Proceedings of the 8th International Conference on Learning Analytics and Knowledge (pp. 270–279). ACM. Retrieved July 31, 2018, from https://dl.acm.org/citation.cfm?id=3170410. Hunt, D. N., & Lawson, D. A. (1996). Trends in mathematical competency of A-level students on entry to university. Teaching Mathematics and its Applications, 15(4), 167–173. Retrieved July 30, 2018, from https://merga.net.au/Public/Publications/Annual_Conference_Proceedings/2017_MERGA_annual_conference_proceedings.aspx. Koenig, J. (2011). A survey of the mathematics landscape within bioscience undergraduate and postgraduate UK higher education (p. 22). Leeds: UK Centre for Bioscience. https://doi.org/10.11467/344. Matthews, K. E., Belward, S., Coady, C., Rylands, L., Simbag, V., Adam, P., & Tariq, V. (2012). The state of quantitative skills in undergraduate science education: Findings from an Australian study. Office for Learning and Teaching: Canberra. Retrieved May 13, 2016, from http://researchonline.jcu.edu.au/26400/1/QS_report_July2012.pdf. MacGillivray, H., & Wilson, T. (2008). Quantitative diversity: Disciplinary and cross-disciplinary mathematics and statistics support in Australian universities. Australian Learning and Teaching Council. Retrieved July 25, 2018, from http://www.olt.gov.au/resource-library?text=mathematics. McPhan, G., Morony, W., Pegg, J., Cooksey, R., & Lynch, T. (2008). Maths? Why not? Final report prepared for the Department of Education, Employment and Workplace Relations. Canberra (Australia). Retrieved July 25, 2018, from https://www.aamt.edu.au/content/download/33194/469618/file/MaWhNot_Published.pdf. Overton, T., & Johnson, L. (2016). Evidence-based practice in learning and teaching for STEM disciplines. Retrieved April 20, 2018 from, http://www.acds-tlcc.edu.au/wp-content/uploads/sites/14/2016/07/ACDS-stem-principles-WEB.pdf. Pohjolainen, S., Nykänen, O., Venho, J., & Kangas, J. (2018). Analysing and improving students’ mathematics skills using ICT-tools. Eurasia Journal of Mathematics, Science and Technology Education, 14(4), 1221–1227. https://doi.org/10.29333/ejmste/81869. Wienk, M. (2015). Discipline Profile of the Mathematical Sciences 2015, Australian Mathematical Sciences Institute. Retrieved May 13, 2016, from http://amsi.org.au/wp-content/uploads/2015/08/discipline-profile-2015.pdf.